Participating educational organizations have been determined. The following five educational organizations will present new mementos/souvenirs created through team exploration of the identity of Nagoya: Aichi Shukutoku University, Sugiyama Jogakuen University, Nagoya University of Arts, Nagoya Institute of Technology and Meijo University. The CODE | NAGOYA 2011 project is a collaborative initiative with the city of Kobe. The following Kobe-based educational organizations will participate in the project: Kobe Design University, Kobe Shukugawa Gakuin University, Kobe Women’s University, Kobe Yamate College and University of Marketing and Distribution Sciences. On Friday, October 21st, all the teams converged at IdcN, where they held a kickoff meeting. We plan to exhibit the products of the research in other design cities across the world. 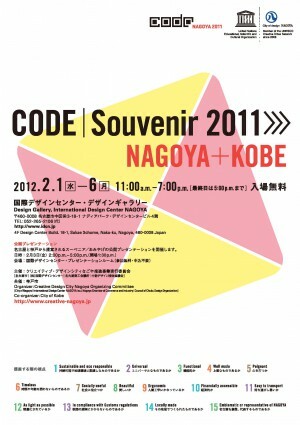 CODE | NAGOYA 2011 Participating educational organizations have been determined.